Hydrate – in hot weather, our bodies dehydrate more easily than normal. And for this reason, it’s extra important to keep yourself hydrated. Drink plenty of water. Drinking enough water is extra important in the heat & humidity. Your body needs water to replenish what it excretes in sweat. Electrolyte drinks (Gatorade, Poweraid, etc) can also be helpful, BUT the rule of thumb is that you don’t need to even consider this type of drink unless you’ve been sweating during your workout for more than an hour. It’s also important to remember – if you have been dehydrated before, you are more susceptible to become dehydrated again. So if you fall in that category, you need to be especially careful. Time Your Workouts Appropriately – if you want to workout outside – get in a run or a ride or a hike – make sure you get your workout in before it gets too hot. Peak heat is typically between 10am – 2pm. If you’re going to work out outside, I recommend going first thing in the morning – the earlier the better. Because even in the late afternoon and evening, the heat & humidity can be severe. 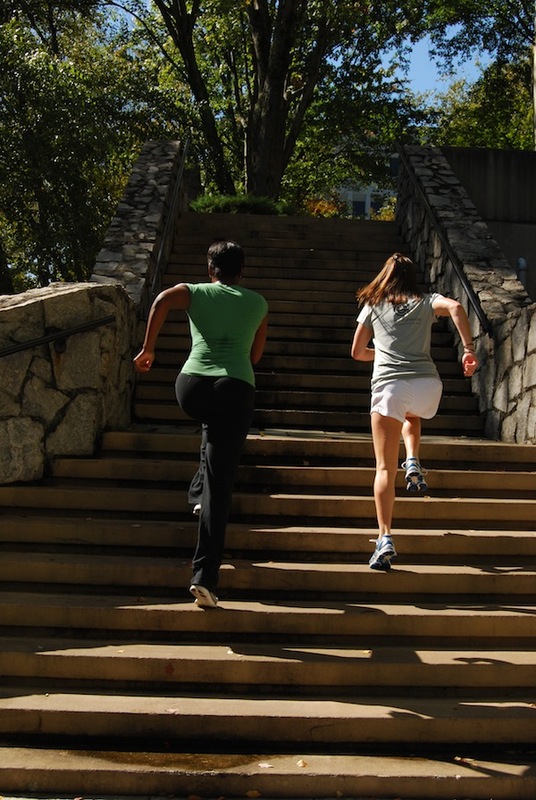 Utilize the air conditioned space in your gym or your home – I love to run outside. I get bored on the treadmill. But there are some days when it is just too hot. Be smart – if it feels like you’re melting when you step outside, it’s probably not a good idea to go for a run in the heat. Use the space indoors to put together a cardio & weight circuit. Try a new class at your gym. Or use our old school playlist to get you through your run on the treadmill. Active.com provides 8 Tips for Exercising in the Summer Heat, which reinforces our 3 tips above and adds a few more. WebMD gives us some Great Summer Workout ideas on ways to exercise on vacation with these workouts that can be done virtually anywhere. Learn the signs of heat stroke (hyperthermia) – Health A-Z on SparkPeople.com provides a pretty comprehensive section on heat stroke, how to identify it, and what to do if it happens. Planning a trip to the beach? Check out Women’s Health’s ideas for a Beach Yoga Session to strengthen & tone. And once you’ve gotten in your summer workout, you need fuel for your body – check out Yahoo’s article on Summer Super Foods. This article provides ideas for foods that help your body adapt in hot weather – including strawberries, iced green tea, and even beer! Got tips you’d like to share on summer exercise? Please post in our comments section!